Couple of weeks ago I got really lucky on LiveJornal. An Australian working in a pastry kitchen shared her Pavlova recipe with me. Since then I was eager to try it and finally did. I made my last Pavlova following a recipe from my all time Le Cordon Bleu Dessert Techniques. Looking at its pictures my Australian counterpart noted the meringue looked quite weird to her. It should have been taller and decorated in a different way. After comparing the recipes I figured out several differences. To make the meringue the Australian Pavlova recipe suggested caster sugar (instead of icing sugar in my book). On top of caster sugar, the recipe suggested folding almost the same amount of icing sugar into the meringue, when it's already stiff. In the Half-a-teaspoon meringue class this Saturday I got that so much sugar might have been needed to stabilize the meringue (prevent it from rising in the oven and then falling back down). Thus I baked the Pavlova once again and it came out looking much more classical. With sour strawberry topping it is tastes just unbelievable. And feel very rich as I still have some for breakfast tomorrow. Beat the egg whites with salt till they form soft white foam. Gradually add the caster sugar while continuing to beat. Beat till the meringue turns glossy and holds stiff peaks. Add the icing sugar, cornflour, vinegar and vanilla and gently fold in using a plastic spatula. Scrap the butter onto a baking sheet covered with baking paper. Use the spatula to form a tall round cake. Bake at 150C for 1 hour. Then turn the oven off and let the Pavlova completely cool down inside. This will take several hours, so it's wise to make well before serving. 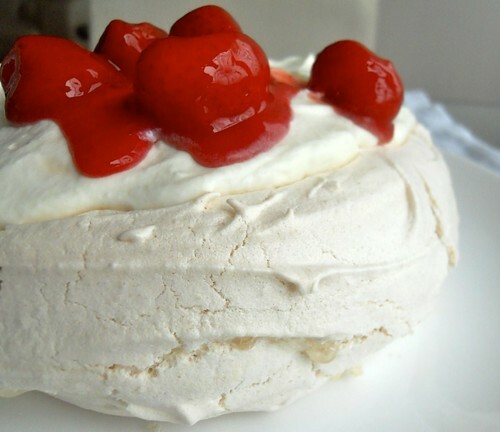 To serve Pavlova make Chantilly cream by whipping the cream with icing sugar and vanilla till soft peaks. Up to 1 hour before serving cover Pavlova with Chantilly and fruits. It's better not to do this earlier as the meringue easily melts when it gets in contact with cream and fruits. Now just dip your spoon in. Isn't it amazing? Yes, it is amazing. Great looking and wonderful sounding. Thanks for sharing. As an American living in New Zealand, I am always on the lookout for a good 'pav' recipe. Australia and New Zealand have a long standing disagreement about which country invented the dish; both claim it as an iconic national dessert. I have never seen a recipe that uses icing sugar at all; I will have to give this recipe a try. If it does add to the structural integrity, that would be good, as mine does tend to crumple a bit upon cooling. fyi, the most traditional Kiwi topping is kiwifruit and strawberry; second runner up would be a passion fruit topping of some kind. Thank you so much for sharing this! I get that I definitely need to pay attention to kiwi next time:-). I'd love to try passion fruit as well, but it is really hard to find in Moscow.. Le Cordon Bleu recipe uses way less sugar than this one. I must say that this one makes a much more stable meringue (it holds shape better while baking and cooling down). But it still had some cracks on it when it cooled completely. Hope to read about it on your blog later.